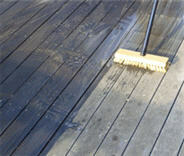 Here are steps on cleaning the surfaces of the wood deck to remove debris, grime and lighter stains. 1) Decide on a order of work sequence. This usually involves working from top, downward. 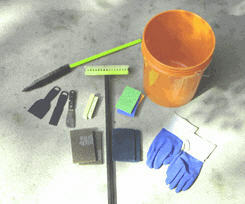 2) Clean any loose debris from the surface, including any insect webs and fall-off from asphalt shingles. A portable blower saves time on this. Any insect boring corridors should be addressed now and you may want to caulk these shut when the wood is thoroughly dry, which should cure. 3) Take a thin putty blade and clear free the plank gap spaces. This is important to promote circulation, in and around the slats and joist areas below. Either vacuum or blow clean as you progress. 4) Mix the cleaning solution, making note of the dilution ratio that is being used. Usually the same strength mix should be used throughout and if in doubt, contact a tech directly. 5) Wet any and all plantlife and sensitive areas around the deck space, including beneath it, if there is a raised platform. 6) Fill the pump-sprayer and wet the woodgrain surface - in some areas a sponge may work better, bringing some mechanical force to the process. Let the solution settle into the wood cells, and then begin scouring the deck rails and spindles (spelled out in cleaning details). Of note is that rewetting a concentrate can reactivate some solutions, but be sure to keep a slow running hose nearby. It is not unusual to have to make several passes to clean oils and greyish matter that active ingredients, like sodium percarbonate, tend to draw out. Work in sections, alternating the inner and outer rails as you go. 7) Proceed on to the slat walking surface, with a larger deck brush on a handle. Brushes with natural fibers do enter the smaller pores better than say, most typical nylon-brushes. 8) Base the total cleaning on the total assembly, including any exposed underside, as planned for with the finish sealer. If the underside is to be coated like the rest, then clean it as above. But if the underside joists are pressure treated and the top is other than treated, you may want to scrub it with a solution and flush afterward. 9) After dry, take a look at all the surfaces. There should be a consistent appearance with all stains, streaks and grime having been gone. Some areas like walking surfaces frequently take a second pass, which comes easier from having been already cleaned. If some pieces need replacing due to cupping, for example, at the handrail joints, keep in mind that milled wood that is harvested from different times will have different appearances. Wood that is dull however can usually be livened with a wood brightener. If there is any rotting, this could be more urgent and here staining might be a consideration unless the deck is relatively recent. It is important that the specific deck cleaner be coordinated with the type of wood deck. Be it epi, pressure treated, cedar, mahogany or other. Always follow product recommendations. And for working around stronger solutions wear a breathing apparatus.